In the video above you can see the time lapse of the building work to prepare a boarded up chimney breast. First we 'knock out' the opening and on this occassion find the brick work to be particularly moist and crumbling. We then decided to allow the chamber to dry out for a couple of days before laying the black Italian slate hearths and re building and installing a lintel. The chamber was re built with reclaimed bricks sourced by the client. Once completed we made good to the plaster work around. 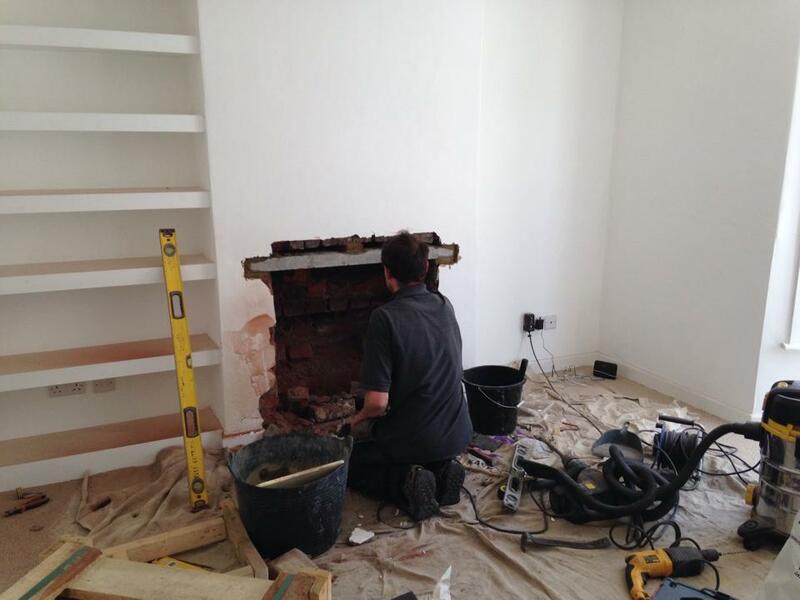 We can undertake all types of work to prepare your setting for the stove installation proper. Fireplace prep work can include anything from 'breaking out' a blocked up breast to removing an old gas stove and liner. We can prepare the chamber by rendering, repointing or dry lining with fireboard. Other prep work includes beading and plastering to make good. We can also supply and install fireplace surrounds and surface mount timber beams over the fireplace aperture. It is regulation to protect the floor with a hearth of more then 12mm in thickness. We can provide and lay a number of different materials as hearths or work with material provided by you, so long as it satisfies regulations. Our most popular hearth options include the honed black Italian and textured Riven slate (both pictured below). The Riven slate is a natural product and as such texture and colour may vary. Stovax View 5T on black Italian honed slate with slips. The black Italian honed slate is 20mm thick and gives a deep black finish when oiled. Charnwood C Five installed with three piece riven slate hearth. The 25mm Riven slate has texture throughout and the darkness may vary. Above shows two examples of Riven slate, the colour and texture can very quite dramatically as it is a natural product.